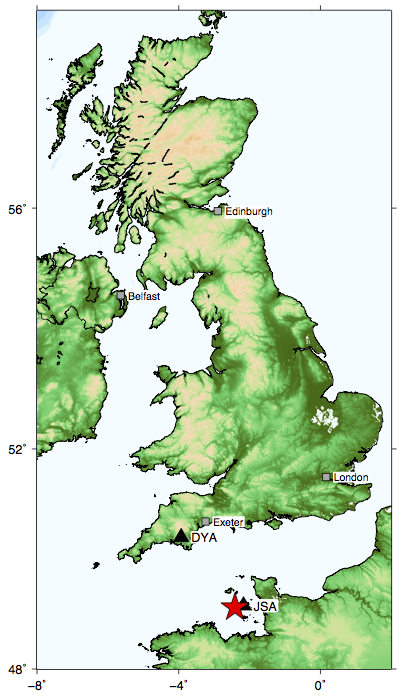 We used broadband waveforms from the British Geological Survey's seismometer network. For this earthquake, we used a total of 2 stations, each comprising 3 seismometer components. Waveforms were initially converted to displacement by removing instrument response and integration. 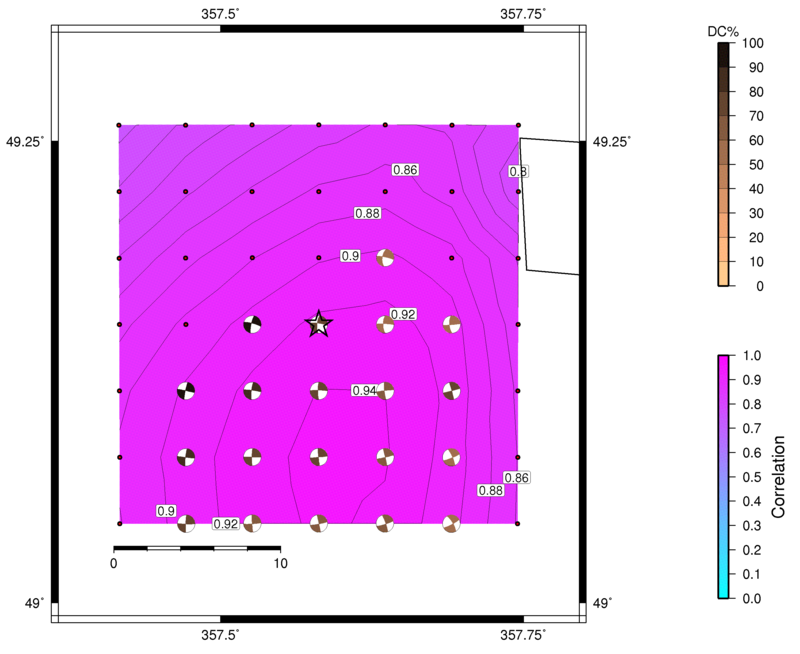 We used the BGS hypocentre location (longitude = 2.414°W, latitude=49.153°N). The crustal model was based on the P-wave velocity model of Booth (2010) and a constant Vp/Vs ratio of 1.77, which was based on on Tomlison et al. (2006). For the moment tensor inversion, we used the ISOLA software package (Sokos and Zahradnik, 2008), an interactive MATLAB-based GUI. We solve for the deviatoric part of the moment tensor. The frequency band for the inversion was selected based on careful analysis of signal-to-noise ratio and the stations' epicentral distance. Map of BGS epicentre location (red star) and stations used for inversion (black triangles). Click for a larger version. Correlation vs depth plot. Click for a larger version. First, the depth of the centroid was found by keeping the epicentral coordinates fixed and by searching over a line of sources beneath the epicentre (2 - 30 km in steps of 2 km). The highest correlation with the observed waveforms is found in the depth range 6 - 12 km, over which the focal mechanism remains stable. 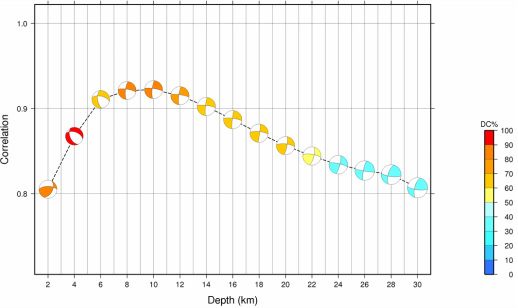 The best correlation with the waveforms is found at 10 km depth - this depth agrees well with the BGS hypocentre estimate of 12 km. A high percentage double-couple (%DC) is also found at this depth indicating a stable solution. A depth of 10 km produces a very good fit to the observed waveforms, as shown by the high variance reduction (0.85). The centroid location was found by grid searching over a horizontal grid at 10 km depth. The grid was 28 x 28 km in size with a uniform spacing of 4 km. Our analysis showed that the focal mechanism style was stable throughout the grid. The exact centroid location was well constrained and found to lie ~8 km to the south of the earthquake epicentre. This centroid location resulted in an better fit to the observed waveforms and a total variance reduction of 0.90. 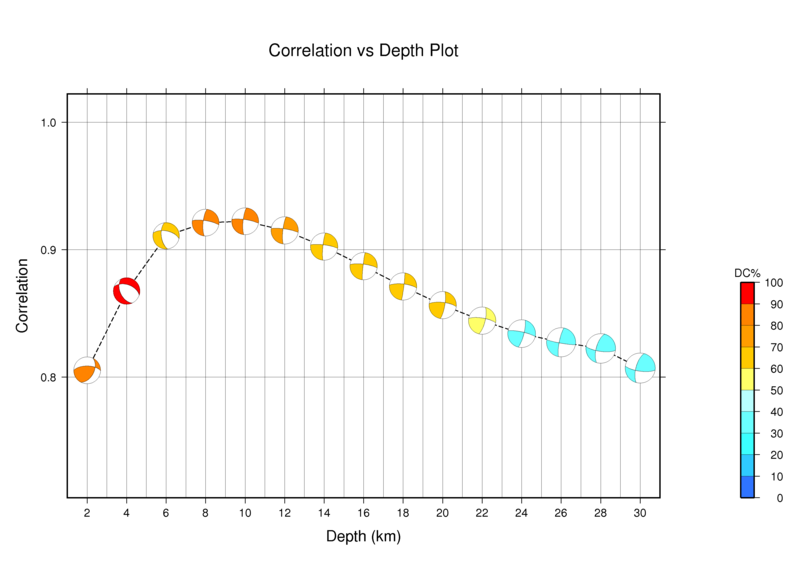 Waveform correlation (contours) for a grid of trial sources at 10 km depth. Only trial sources with correlation of greater than 0.9 are shown. Click for a larger version. Comparison between synthetic (red) and observed (black) waveforms used in the inversion. Variance reduction for each waveform is shown in blue. Full moment tensor parameters are available as a text file. Download here. Map showing the location of the centroid and the focal mechanism. The red star is the BGS epicentre location. 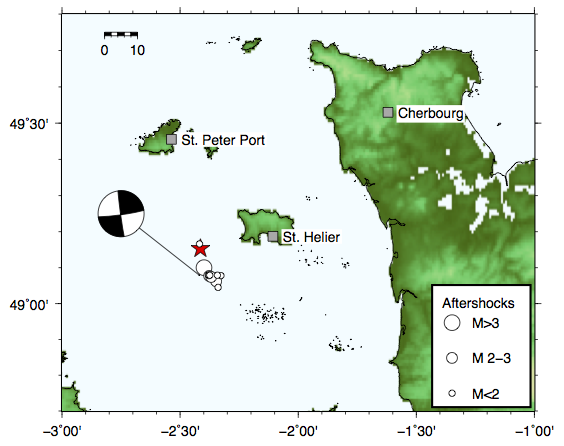 Aftershock locations (up to and including 30/07/14) are also plotted. The best-fitting moment tensor produces a focal mechanism which has pure right lateral strike-slip faulting (i.e. horizontal motion along a steeply-dipping fault plane oriented either north-south or east-west. Due to the alignment of aftershock locations in the north-south direction, the north-south fault plane may be preferred. However, it is not possible to definitively state this due to the inherent poor location resolution for earthquakes that lie away from the main BGS network. This moment tensor solution is publicly available and free-to-use under a Creative Commons license (CC-BY). However, credit must be given to the author when citing this work. Citation: The 11 July 2014 Jersey, UK earthquake: a preliminary moment tensor solution from full-waveform inversion. Stephen Hicks. figshare. Booth, D.C. 2010 UK 1-D regional velocity models by analysis of variance of P-wave travel times from local earthquakes. J. Seismol., 14 (2). 197-207. doi: 10.1007/s10950-009-9160-4. Sokos E.N. and Zahradnik, J. 2008 ISOLA a Fortran code and a Matlab GUI to perform multiple-point source inversion of seismic data, Computers & Geosciences, 34 (8), 967-977. doi: 10.1016/j.cageo.2007.07.005. Tomlinson, J.P, Denton, P., Magure, P.K.H., Booth, D.C. 2006. Analysis of the crustal velocity structure of the British Isles using teleseismic receiver functions. Geophys. J. Int., 167, 223-237. doi: 10.111/j.1365-246X.2006.03044.